NASA GISS gets slammed in Inspector General report for questionable '$1.63 million of GISS’ expenditures since 2012' | Watts Up With That? GISS is a major contributor in helping NASA meet its Earth science research goals, in particular the Agency’s effort to improve the ability to predict climate change by better understanding the roles and interactions of the ocean, atmosphere, land, and ice in the climate system. In addition to climate modeling and maintenance of publically available climate-related datasets, the Institute’s major efforts include research in atmospheric chemistry, astrobiology, aerosols, and water isotopes. 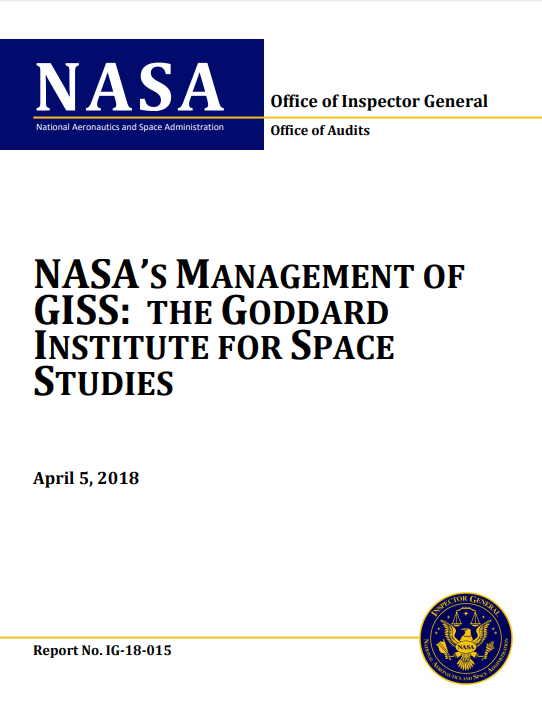 We also found multiple instances of unallowable use of NASA-appropriated funds by GISS employees, grant recipients, and contractors for salary expenses, sub-contracting, and computer equipment. Based on our review of these unallowable expenses, improper charges under GISS’ support contract, and the improper use of purchase cards, we question $1.63 million of GISS’ expenditures since 2012. In our judgment, this inappropriate use of NASA funds was largely the result of insufficient oversight by the principal investigators, NASA’s technical officers, and approving officials coupled with the absence of a senior-level administrator at GISS to manage the Institute’s grants and cooperative agreements. Finally, GISS routinely collaborates with public and private institutions on an ad hoc basis to achieve NASA’s strategic research goals. However, we found that the Institute is missing opportunities to partner with other Federal agencies and entities that conduct similar work because NASA lacks the long-term interagency agreements needed to set goals and objectives and provide needed funding. GISS’ prominent role in Earth science research – as a contributor to the Intergovernmental Panel on Climate Change’s (IPCC) Nobel Prize winning report on climate change in 2007 – coupled with on-duty public outreach and education, as well as off-duty advocacy by individual GISS staff about climate change, has raised the group’s public profile. At the same time climatologists debate the impact of man-made greenhouse gas emissions in predictive models, the issue has carried over into Government policy discussions and congressional hearings about the impact of human activity on global climate change. …they seem to think that the snotty antics of Gavin Schmidt as a holier-than-thou advocate is somehow justified. In my opinion, the OIG missed the biggest, most egregious flaw of NASA GISS: Their role as redundant gatekeepers of climate data that they adjust to be warmer. NOAA already does a global temperature estimate, GISS uses NOAA data, and with their own procedures, comes up with a different number. Their climate modeling is also handled by other agencies and could also be called redundant. In my opinion, NASA GISS is a pointless and redundant waste of taxpayers money. It should be closed. I like the idea a lot, close entire government departments that are redundant. Excellent idea….how can we help make it happen? DOE isn’t needed and most of the time just gets in the way of people who are trying to do the work. There are 15 cabinet positions. Condensing to 3 might be tough as there are several functional allocations that should not be thrown out with the bathwater. Several could be combined such as the Department of the Interior could incorporate Transportation and Energy and perhaps Agriculture. Treasury will swallow Commerce, Labor, Council of Economic Advisers, OMB, SBA, US Trade Rep. However there are completely make-work bureaucracies which could be eliminated. HUD …gone, Education…gone. A moot point regardless. However it is quite obvious that the system in place was set up to create sustainability for the system, not to produce or improve functionality for the citizens. Sounds a lot like Health & Safety..
“A moot point regardless. However it is quite obvious that the system in place was set up to create sustainability for the system, not to produce or improve functionality for the citizens.” a very impotant point made by rocketscientist. this cannot be overstated,government agencies have a tendency toward self preservation way ahead of the actual public service they are employed to carry out. The Federal Government of the United States owns about one third of the land of the USA, 760 million acres. Enough to make quite a living, don’t you think? Close the duplicate ones too. Bureaucrats and especially government ones will always have good reasons for their jobs and how it needs to be expanded and paid more and that results are not part of what they’re doing. It would be interesting if there are actual formal agreements with other countries and the UN for GISS to be a part of IPCC at all. It sounds like their only role is to make data available to the IPCC. If the UN wants GISS involvement, it seems the UN would have to subcontract GISS and pay them. Agreed! Several of the US government agencies are Licensee funded. Like the NRC and FCC, where 100% of their operating budget is obtained from the licensees.They same should be for NASA, They should receive a payment for this “Valuable” data. A large enough payment to pay for the satellites, collection, massaging, etc. Their code shows they only do one adjustment. You are entitled to your opinion, even if it’s wrong. Adjustments using nightlights and population? The GISS analysis assigns a temperature anomaly to many grid boxes that do not contain measurement data, specifically all grid boxes located within 1200 km of one or more stations that do have defined temperature anomalies. Do you think that the temperature reading from a station located in a black-top parking lot, or one located between airport runways, is valid for any area other than a few meters around the station? I have never understood a need to adjust (cool) for UHI. Is not UHI the result of the true urban temperatures? If so they are good enough to use as or correct temperature. I can understand adjusting for improper station placement or operation, but not for recording correct temperatures. The fish that bites and gets away is still meant. Do you think that the temperature reading from a station located in a black-top parking lot, or one located between airport runways, is valid for any area other than a few meters around the station? From Another Doug’s quote above, GISS analysis can potentially assign the temperature anomaly of one station to all grid boxes located within 1200 km of it that do do not have defined temperature anomalies. That parking lot or airport could have a pretty wide ranging effect. Not to say their UHI “adjustments” are remotely adequate (they SHOULD be larger, and increasing with population, etc. ), but there is good reason to do them. Figure 20 clearly illustrates why GISS and their “special sauce” that “adjusts for UHI in a dumb way” is redundant and pointless. So they cool the past (“the record”), making the present look warmer? Playing the fool again or just flat-out lying? The paper that you point to is from 2010. Since then the Karl et al 2015 paper, “Possible artefacts of data biases in the recent global surface warming hiatus” has substantially changed recent temperature anomalies in the NOAA data set. The two data sets are very much in line. More importantly, as you know, UHI only applies to the land, covering 30% of the earth. And only a small part of the land area is affected by UHI – though likely a much larger proportion of temperature stations. Of course, whether you have successfully eliminated data contaminates – and not introduced ones of your own – cannot be fully known. But you can get an indication from looking at the data. 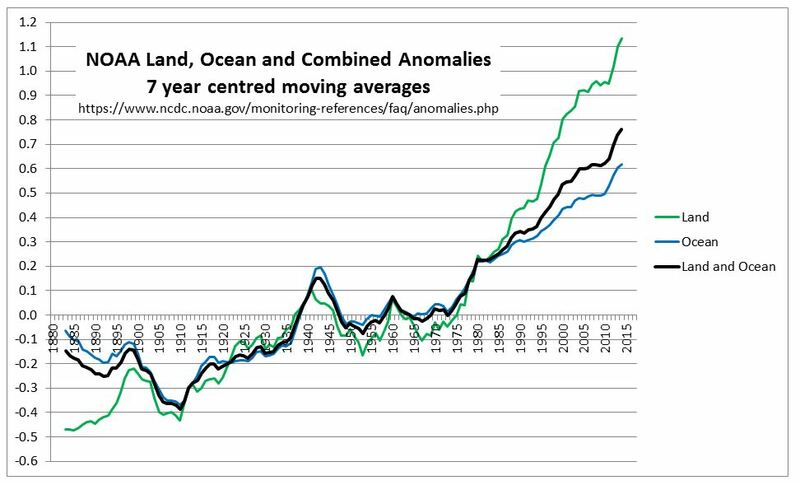 With NOAA’s data set they usefully breaks down its temperature anomaly between land and ocean. When one compares the 1975-2014 warming with the early twentieth-century warming, it appears that the marginal difference in the later period is due to more warming in the land temperatures. The sea surface temperature estimates seem to be pretty much the same in both periods. The most obvious reason for 1975-2014 land anomalies being the odd one out is some sort of bias or biases in the calculation. We have been over this again and again since 2007 when we first requested the code. NASA then apply a UHI correction. We beat this to DEATH for years at climate audit. The UHI adjustment COOLS the land record by a small amount. data and what adjustments they make. You made a simple mistake. Correct it. I trust Steve Goddard’s work, as he validates temperatures against newspaper records of the time. What validation did BEST do? First, thanks to Steve for providing more than a “drive-by” comment. This series of comments is instructive. Second, folks, if you don’t like Steve’s response, don’t attack him – go find data that refutes what he says. Fourth: Steve, if NASA’s only “correction”, for UHI, slightly cools its record, and it gets its data from NOAA, how come the GISS anomalies are pretty much always warmer than those from NOAA? Could it be, IIRC, that NOAA doesn’t infill for missing data, and GISS does? And that much of the Arctic doesn’t have reporting stations, so it is infilled. And much of the Antarctic doesn’t have reporting stations, so it is infilled. And there aren’t many, if any, reporting stations in the interior of South America, or Africa, so those areas are infilled? And, of course, the oceans have very poor coverage as well, so there is infilling there, too? And, lastly: what about where NOAA gets their data – the USHCN, well-known for adjusting and correcting data, and, of course, homogenizing it. There seem to be confused definitions of “data” going on here. And then we try to talk about it as if it all were the same “species”. $1.63 million since 2012. That’s less than a rounding error in a nearly 20 BILLION annual budget. The biggest scandal, of course, is the vast sums they have spent pushing CAGW. I have to agree. Auditors can always find stuff “wrong” if they try. That’s their job after all. Some money allocated in the approved budget to fix the roof gets spent to deal with coliform bacteria in the office drinking water. Technically that’s a “questionable expenditure”. $1.63M in stuff that needs to be looked at seems not worth mentioning..
GISS gets a $20 billion budget? Really? Where did you get that number? Odd, I found this to be far more damning than misuse of funds, “we found that 43 of 66 (65 percent) new GISS scientific publications publicly released from October 2015 through September 2017 were not approved by GISS or Goddard officials prior to release.” It sounds very much like they’ve gone rogue (operating without oversight). Having worked at NSF, there’s no way that would be allowed at that agency. “65% of new GISS scientific publications are unapproved crap”? This seems like a really high percentage of the public releases not going through the formal approval process. It could be (speculation) related to the large number of Columbia University researchers at GISS, which may not be routing their publications through the NASA system. As I said, I worked at NSF and ALL of their research is via grants to non-NSF researchers, there’s no way NSF allowed the results to be published without some kind of oversight. I believe NIH and NIST are the same way. Maybe the reason for the “unapproved” publications is that “it takes too long” to get approval. By the time everyone has checked the appropriate boxes, the information will be outdated. Or something. Why would they be submitted to review when all the reviewers will do is find something wrong with it? I admit to being astonished that the papers are released without even an internal review. I would never have guessed such a thing was possible. Moreover, we found inadequate NASA guidance related to the independence and qualifications of the initial approver in the technical review process and other practices not in conformance with best practices. Even the paper that were reviewed were assessed in a biased manner. Loyalty to the team (and your job) doesn’t help weed out biased results. This is the official confirmation that GISS suffers from Groupthink. If people say that their peers outside GISS agree so although they may be biased they are still right, then one should question whether their collaborators are fully independent too. Agreed. The whole AGW cartel is one big GroupThink Tank. From the quote to “official confirmation that GISS suffers from Groupthink.” Wow, that’s a giant step in logic. No bias there! Ignoring malpractice is a sign of bias. Confronting it is not. But I guess all your colleagues agree with you so thinking is not required. kristi silber, Sorry about the intemperate response. You are not ignoring the evidence of Groupthink. In fact, from all the findings against GISS in this article, it is only the evidence of Groupthink that you respond to. You are right that this is important. Now start doing something to stand against it. I agree. Having some 65% of the released studies not approved according to procedure is major. Was that the initiative of one or a few persons bypassing procedure, and if so, who? Two thirds of their output is unathourised, who is running this Mickey Mouse organisation and why do they still have a job. Old44, Tom wasn’t saying 65% was a few, he was asking if the 65% is the result of the actions of “a few persons”. I do agree with you that those whose job it is to be in charge of that organization should lose that job over such a blatant disregard for the proper processes. I have never worked for the government, but if a corporate audit indicated our clinical trial data (or say label claim data) was published without following standard design control procedures the executive leadership would have a team of folks looking into the system failures proto. Corporate executives at R&D driven firms would be well aware that if an external audit team had come across that many critical design control failures, such as those as documented as existing at GISS, the firms integrity would be called into question. The high failure rates exhibited by GISS reminds me what must of happened at VW over the years leading to the investigative arms of the German judicial system closing down any future work out of certain group(s) until the impact of the systematic failures were identified and addressed. 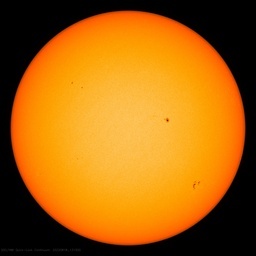 Out of curiosity, do you know why NASA adjusts for UHI and NOAA apparently doesn’t (don’t know if they do or not)? Why is the National Aeronautics and Space Administration Goddard Institute for Space Studies spending any time or money on anything other than space studies? The Congressionally-mandated “Mission to Planet Earth”. ‘Nuf said. I could be way off but I think OIG just audits financial and administrative function, not actual content of the work. Not sure whose responsibility it is to audit research process and outcome. The OIG’s responsibility is to ensure all regulations and Federal laws are met. It is unlawful to change Federal data and present it without caveats and attribution. Content that is a result of failure to follow Federal law or regulations is fully the province of OIG. Especially where that content is a result of embedded activism or advocacy. Results that indicate internal failures, mishandling, misappropriations, preferential treatment, conflicts of interest, etc. All the province of OIG offices. All Auditor generals have a mandate that runs something like this “Value obtained for Money spent”. The problem is that “Value obtained” is defined as the value that the government of the day attaches to the project regarding the project goals. So the auditor is constrained within those definitions. That government defined value for the project may be such as the following: Project goal” Throw rocks over one side of a wall and then throw the same rocks back over the other side of the wall.” The value will be the temporary placement of the rocks upon landing on the other side. The auditor general cannot comment on the real value to the taxpayer of such a project. All the auditor general can do is to measure how efficiently the rocks were thrown, check whether internal procedures were written and whether they were followed and also check if any internal audits (if any) were done correctly and then detail any wastage. Such is the life of an auditor general auditing any government project. useless organizations producing useless information at extreme cost to the taxpayers. Gavin A. Schmidt is a climatologist, climate modeler and Director of the NASA Goddard Institute for Space Studies (GISS) in New York, and co-founder of the award-winning climate science blog RealClimate. How much does it cost to establish a website like RealClimate? Schmidt is a mathematician who has worked on climate models. He understands very little of the real climate. He lives in the fantasy world of climate models. Go here to directly comment about the OIG report. Pruitt wants to spend 100000usd per month on private jet. Wants to spend 70000 on a couple of desks. And wants a bullet proof SUV and motor cafe to dodge Washington DC traffic. If that’s less money to spend on Climate “science”, I prefer a nice desk. Multiply your annual estimate by 1,000 to get the correct amount. Ghalfrunt: Sometimes it is an enlightning exercise to play devil’s advocate for yourself and say, for example, OK, lets suspend belief for a moment: what possible sensible reason could Pruitt need a bullet-proof SUV? It is a method of creative thinking that can give surprising answers. I use it all the time. My next thought is: I hope POTUS wears a bullet proof vest. According to a local Oklahoma news radio station, Pruitt has been the subject of more death threats than any other Trump administration official, so a lot of those expenses are for increased security. Put in perspective the security budget for a weekend trip to Mar-a-Lago is more than this. That budget has had to be expanded above previous administrations several times already. GISS’s approach to the UHI impact on measured temperatures is flawed. The paper Mosher linked to is worth reading in order to understand just how misguided climate scientists are in constructing temperature data sets. I read Hanson’s 2010 paper several years ago and the only lasting impression was that there is no intellectual rigor to their handling of data. Hanson uses light data to analyze the UHI and basically find that it is a minor issue. So yes, they cool the data by a very small amount and wash their hands of the problem. I would argue that the real impact is to artificially raise the reported temperature data by neglecting the issue. Hanson’s approach totally fails to capture the site selection problems that contaminate the temperature data. The basic problem is that much of the temperature data is of very poor quality and there is no amount of manipulation that can fix it. When you look at the temperature data for the US in Hanson’s paper (Figure 5) the only thing that sticks out is the cyclical variation due to the AMO. The Global Land-Ocean temperature they present in Table 3 and in other tables is just not credible. I believe that the Hanson 2010 paper is all the evidence you need to totally defund GISS. The paper is just a souped up version of Al Gore’s books. Ghalfrunt would appear to be a government bureaucrat if it’s okay with him that employees steal 300/yr. Why would NASA even have “earth science goals”? Aren’t there other goobermint 3 or 4- letter departments for that like NOAA? Mission to Planet Earth, mandated by Congress. To what extent did Obama block OIG from even looking at GISS prior to this report? Put the results in the personnel review process and start firing people responsible. This sort of behaviour would not have been tolerated in companies I worked for. People would have been immediately sacked for not following procedures. Do there tax-payer funded organisations sack people? When I worked in industry, there was a rigorous paper review process – reviews for accuracy of content, any proprietary content, ITAR and security. If the paper was produced under contract funding, then the contracting agency also had to review the paper. The cycle took between 3 weeks (not a contract effort) and 6 months. And ignoring the process was not good for one’s career. On a side-issue, anyone notice how every cab ride Pruitt takes is attacked on the front page? The press can’t seem to find anything wrong with any of the previous EPA administrators, though. Pruitt is being attacked by the Left because he is one of Trump’s most effective cabinet members at dismantling regulations Obama put in place. Pruitt is number one on the Left’s target list, with the exception of Trump. But no one is actually held to account — A basic characteristic of The Swamp and one of the reasons it thrives. OIG findings don’t matter if there is an understanding and trust that there will be no consequences. Can one have input into the process from outside? A starstruck OIG should be an oxymoron. They are there to criticise (inspect) and it seems they blast them for shoddy, negligent practices and then undo the intent with high praise and an endorsement. I think you (Anthony) should send this WUWT evaluation off to the OIG. There is a ‘deep state’ hangover of OB disruptors hanging in there like Zebra mussels. $1.63 million of misspent/questionable funds since 2012 from a department with a $19 million annual budget is small peanuts. It’s the $19 million in redundant (unnecessary) expenditure on tasks better handled within the scope of other agencies, especially if 65% of their publications (propagada) are released without official authorization or full technical review is the real outrage. Al Capone was convicted of tax evasion, not murder. Better for Trump to start winding down NASA since any appointee to NASA will not be approved by Congress. If Trump can get the “Space Corps” approved past Dept. of Air Force objections, NASA’s days will truly be numbered by one Fiscal year. GISS is a taxpayer funded propaganda factory… shut it down. Not to mention Gavin’s blogging on the taxpayers’ dime. He and Kevin should both be given one-way tickets back to their respective island nations, there to search for the missing heat in the oceans around them. GISS was Founded by Robert Jastrow, who wanted to support Space explorations. The original mission was to support space exploration, by study of planetary atmospheres among other things. It has been corrupted to providing support for the government mandated AGW paradigm. Inspector General examinations are aimed at preventing inefficient or illegal operations. The report is not about weather, climate, or science, and it is not an IG’s job to do so. If there is a great God who cares about creation, it has got to be face palming right now. We are in a warm period. Check. The ocean surface is belching out that warmth. Check. Nothing else needs to be figured out about the sensors telling us what we already can do just by stepping outside about being warm. So stop studying what has been confirmed MULTIPLE TIMES. Here is what we don’t know. GISS, NASA, and NOAA need to figure out how to tell if consistent COLD patterns are just another plateau blip or signals the initiation of the jagged downslope. $1.6 million in, what 5 ou 6 years ? 300k a year? Sure, yes, it must be addressed, but, no, this is no big deal. “43 of 66 (65 percent) new GISS scientific publications publicly released from October 2015 through September 2017 were not approved by GISS or Goddard officials prior to release. ” This, however, is horrible, as pointed out before me by others.